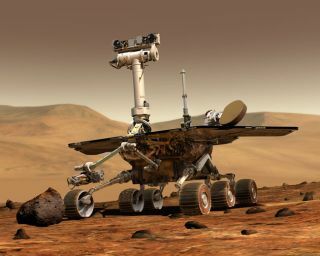 NASA's Opportunity Mars rover is poised to break the distance record for off-planet driving, but any celebration of this exploration milestone will have to wait until scientists figure out exactly what the record is. The all-time mark is held by the Soviet Union's remote-controlled Lunokhod 2 rover, which traveled about 23 miles (37 kilometers) on the moon back in 1973. Opportunity is breathing down Lunokhod 2's neck, having racked up 22.75 miles (36.61 km) on Mars since touching down in January 2004. "They didn't really have any good orbital images in which to operate [Lunokhod 2], so their estimate, which has been published for many years, of 37 kilometers is highly uncertain," Opportunity principal investigator Steve Squyres of Cornell University told reporters today (June 7). "We have enormous respect for what the Soviets managed to accomplish in 1973 with the technology of that day," Squyres added. "And so we would not want to claim to have beaten the record until we're really sure that we did it." Scientists now have high-quality images of the moon taken by spacecraft such as NASA's Lunar Reconnaissance Orbiter, and some of these photos even show Lunokhod 2's tracks. So researchers could nail down the longstanding off-planet driving record if they wanted to, Squyres said. A stereo pair of images from taken from Mars orbit were used to generate a digital elevation model that is the basis for this simulated perspective view of "Cape York," "Botany Bay," and "Solander Point" on the western rim of Endeavour Crater. The view is from the crater interior looking toward the southwest, and the vertical exaggeration is fivefold. But he and his fellow Opportunity team members have no plans to do this work themselves. "We are just going to patiently wait until somebody, either in Russia or in the United States, comes up with a really well-calibrated number for how far Lunokhod actually drove, and then we'll see," Squyres said. The Opportunity rover has been exploring the rim of 14-mile-wide (22 km) Endeavour Crater since August 2011. Last month, the robot departed from a site called Cape York, where it found evidence of a possibly habitable ancient environment, to head toward Solander Point, which lies 1.4 miles (2.2 km) away. Mission scientists want Opportunity to investigate Solander's many layers of exposed geological material. The area also has a north-facing slope, which will allow Opportunity to point its electricity-generating solar panels toward the sun during the coming southern-hemisphere Martian winter, which peaks in February 2014. Opportunity already holds the American record for off-planet driving, wresting it away last month from the Apollo 17 moon buggy, which NASA astronauts Gene Cernan and Harrison Schmitt drove 22.21 miles (35.74 km) across the lunar surface in December 1972.